The Feltmakers were delighted to host the 2015 Inter Livery Tennis Tournament last week at Queen’s Club. With a fine drizzle in the air at 10 am, nervousness that the forecasters’ predictions of zero chance of rain for the whole day was, thankfully, proved to be unfounded. We enjoyed a dry, if largely cloudy, day – near perfect conditions for vigorous exercise. 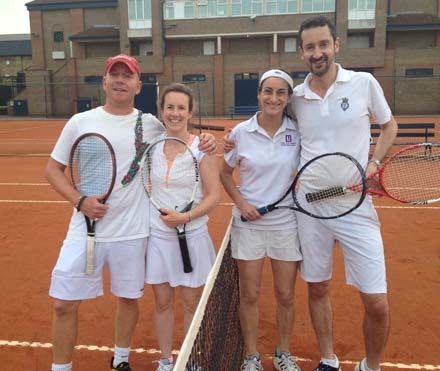 This year we were at full capacity with 24 teams playing on Queen’s Club’s six shale courts. A competitive ’round robin’ of four teams per court playing the best of 9 games determined the 8 teams who proceeded to the Quarter Finals of the Championship with the remaining 16 teams fighting out what proved to be a tremendously competitive Plate Tournament. The Plate Competition included some exciting matches between pairings who were unlucky not to have progressed to the Championship Competition, with a final between the Salters, represented by Ellie Hill and Tom Wordle, and the Mercers, represented by Kate Evers and Thom Hodson, which was won after a hard fought and entertaining match by the Salters. Championship Finalists (left to right) Drapers Matthew Bell and Amelia Potter, Tallow Chandlers Alex Maxwell-Brodie and Chris Kurkijan. In the Championship Competition, two teams threaded their way from the two poles of the leaderboard, proving the seeding process to be perfectly judged by our Feltmaker tournament referee, Bruce Fraser, with a very strong Drapers’ pairing of Amelia Potter and Matthew Bell ultimately falling to the Tallow Chandlers’ brother and sister team of Chris Kurkijan and Alex Maxwell-Brodie, previously winners of the tournament on a number of occasions. 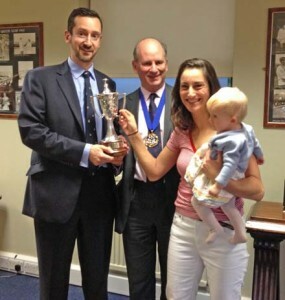 Championship Winners Chris Kurkijan and Alex Maxwell-Brodie of the Tallow Chandlers. We look forward to welcoming the Livery Companies back to Queen’s Club next year and hope to extend the day with the reinstatement of the post tournament dinner in the newly refurbished Club House. Thanks must go to the Feltmakers’ Bruce Fraser for masterminding the tournament and Simon Wood and Simon Millar for their great help in ensuring the day ran smoothly.